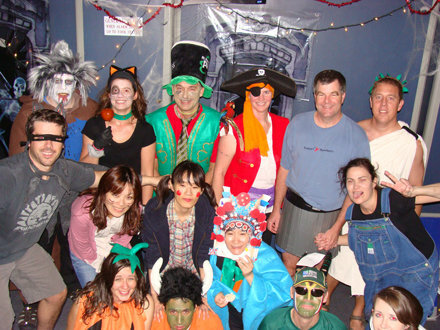 As adults, we don’t often get the chance or have the motivation to go all-out for Halloween. I find that I generally put all of my creativity into my son’s costume, then fall back on my old stand-by witch costume for myself when we go trick-or-treating. When you’re at home, the hustle and bustle of your workaday life also gets in the way, so there’s just no inclination or opportunity to get all dressed up. Out here, though, Halloween gave us something out of the ordinary to look forward to and plan for, and we all enjoyed the promise of a day different from the rest. Everyone put a lot of thought and effort into coming up with costumes that were funny, scary, traditional, or just plain imaginative. It’s amazing what we were able to do with some felt, staples, glue, paint, and whatever else we could find onboard! We had two very Halloweeny Jack-o-Lanterns. Vicky made hers out of felt and string, and stuffed it with bubble wrap. She even had a cute little stem! Everett found that he had a perfectly-hued orange shirt, and added the Jack-o-Lantern details. A green face became his stem. Halloween isn’t complete with out a black cat on the prowl. Louise made a fine feline, dressed all in black, complete with a felt-and-wire tail and black surgical gloves with glued-on claws. There were lots of spooktacularly scary costumes, too! Maggie was unrecognizable as a wicked witch with long green nails (even witches are mainly microbe! ), and Clay was our super-freaky vampire DJ. Tania and Narcisso both embodied different versions of Death; Narcisso was the scythe-bearing, coffin-dragging Grim Reaper of Death, and Tania was the ankh-wearing black-lipped Death from the comic book The Sandman. Luckily, we have lots of tinfoil onboard, because it makes great costume accessories! Sam created a vampire version of Texas Rangers pitcher Derek Holland with a cool set of fangs and duct tape for the text and decorations on his jersey. Of course, being at sea brings out the sailor (or the pirate) in all of us! Alyssa was a cute sailor girl in her striped middy and “pleated” felt skirt. Steffen was a Russian sailor in his striped shirt and stapled-felt hat with a painted insignia and “RESOLUTION” written in Russian. On the outlaw side of things, Beth and I were both pirates. Beth was more of a scallywag pirate with her tattered pants and pleather shirt and hat. I was more of a traditional pirate with my red vest, purple sash and jolly roger on my hat. We were later joined by pirate PYS—a scientist form Korea—who got into the Halloween spirit by decorating his fishing hat with a skull and crossed bones! Arrrrr, matey! There was so much creativity that went into this Mid-Atlantic Halloween. There were cultural costumes like Fengping’s Peking Opera dancer, Heath’s toga, Amanda’s gypsy, and Steve’s leprechaun; characters like Mike’s “Macho Man” Randy Savage, and a whole bunch of just plain imaginative ones like Kristin’s fridge that opened to reveal lots of goodies that we miss. There were way more costumes than I can write about here…you’ll have to check out our Facebook photo album for more pictures! We were also spoiled by the good guys in the galley, who made an awesome graveyard cake, candied apples, and some Halloween sugar cookies for us to enjoy. They also carved some squash and gourds for decorations. They truly are amazing! I’d like to thank everyone who took pictures of the evening and sharing them: Louise Anderson, Clay Furman, Yumiko Harigane and Amanda Haddad.